Microsoft Intune has a pretty good RBAC model to allow you to give permissions to users who need to be able to perform an administrative task or role within Intune. A role can be for instance a predefined role in Intune or a custom role. Before digging into the Intune roles, there are also Intune related roles available within Azure AD. Last month I presented at our local user group (WMUG NL) how many Global Administrators they had in their environment. Several environments had more than 5 Global Administrators in their environment, five is the general recommendation by Microsoft but the lower the better! Not everybody needs to be a Global Admins to do their job in Exchange, SharePoint, Azure AD, or even Microsoft Intune! 😉 Unfortunately, I see a lot of companies not or hardly using any RBAC. As an Intune Administrator you have all permissions within Microsoft Intune, you can do anything you need to do when working with Intune, users and devices. Since Conditional Access is part of Azure AD and its one of the most important ways of protecting your data at the front door, the Conditional Access Administrator is able to manage everything related to the Conditional Access rules. A role in Intune is basically defined by, a role definition, members, a scope and an assignment. Currently the following default roles are available. The Role Definition describes what a member is able to do when member of this role, it defines the permissions on objects in Microsoft Intune. The role definition of default roles can not be changed but when you create a custom role, you can always add or remove permissions. Members are the administrators that need to be able to perform the work which is related with the role. Members are added via Assignments. While Assigning a role you need to add a group of users (administrators) that need to be member of the Role. The Scope is a group of Users or Devices that can be managed by the members added in this Role Assignment. If you add a Group of Users, the users and related devices are part of the scope, when adding a group of devices only the devices can be managed. New to RBAC is that we are now also able to create and assign Scope Tags. With Scope Tags we are able to tag an object so you are able to filter objects based on the tags assigned. So, in what scenarios are we able to use this? 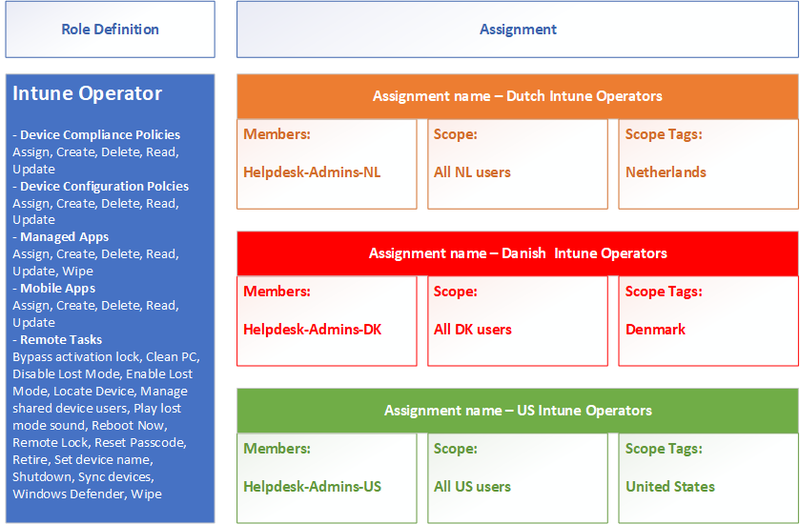 So, if we create a role called Intune Operators for Intune Administrators in The Netherlands, Denmark and the USA, that need to manage the users and their devices in the country they represent. Also, the Intune Operators need to be able to create, read and assign Configuration Profiles, Compliance Policies and Applications for their country they represent. The result of creating a role as above, allows the members to manage Device Compliance Policies, Device Configuration Profiles, Managed Apps, Mobile Apps and execute Remote Tasks. 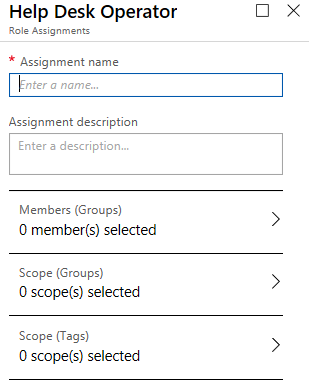 Since per assignment a scope with a user group is added, the Intune Operators only see users and devices of their scope. Next to this the Intune Operators see the objects tagged for their “country” and objects that are not tagged. When an Intune Operator creates a new profile, the profile is not automatically tagged for the “country”, the admin needs to tag the object themselves.